On and off the court, Gael Monfils is known for putting on a show and the Taste of Tennis event in New York City was no exception! Taste of Tennis is a delicious evening that combines your favorite tennis players with famed professional chefs. While some players had their eye on the chef’s table, the Frenchman was all about the DJ Booth. Before the party kicked off, the tennis star and DJ Mad Linx spoke to host Mayleen Ramey, “I’m DJ Mad Linx and this is DJ Gael Monfils. He has DJ skills and you guys will get a chance to see it later tonight!” When asked if Gael had a special DJ name, the tennis star teased with a bit of mystery. As promised, Monfils heated up the event hotter than a kitchen stove! Just when you thought the night couldn’t get any better, Gael invited a few of his friends to join him. 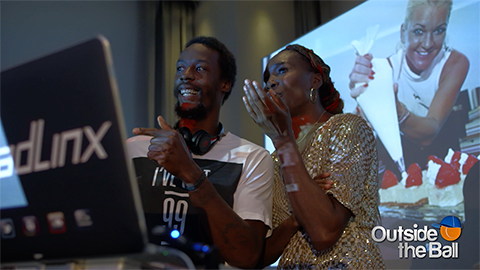 Americans Venus Williams and Frances Tiafoe accompanied the mixmaster with their own sick dance moves! With amazing beats and fun guest appearances, this is one video that will get you on your feet! Gael Monfils Gives Us the Dish On French Cuisine Outside the Ball’s VIP Invite to the Taste of Tennis Tennis Fans Vote, Compete & Meet Chuck the Duck Caroline Wozniacki Gets Glamorous for the Taste of Tennis and We’re Invited to Go Along! Garbiñe Muguruza Cooks Up Her Favorite Pre-Match Meal at Taste of Tennis Master Class Tennis Pros are Foodies Too But Who Is the Top Chef? Tsonga, Halep, Pospisil or Venus Williams?